Anderson Group is understood to have been awarded the first contract package for construction of Tottenham Hotspur’s new £400M football stadium in North London. Sky Sports News has reported that the contractor secured a £50M deal to carry out foundations and concrete structures works, including construction of upper floors and stairways. Sky Sports News said it had seen a letter sent from Savills to Haringey Council confirming this, which stated: “THFC have today entered into a Joint Contracts Tribunal (JCT) Design and Build Contract for the civil engineering ground works, concrete foundations and structure for the new THFC Stadium Project. Anderson Group carried out a similar package of works on Tottenham’s £45M Training Academy at Bulls Cross in Enfield, where McLaren Construction was main contractor. Once completed the new stadium will be able to hold 56,250 spectators. 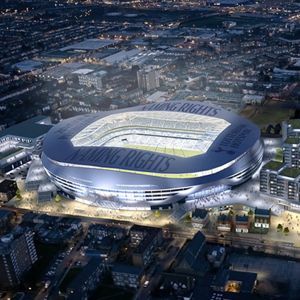 In July Tottenham Hotspur was given planning permission to use the site it had earmarked for the project by Communities Secretary Eric Pickles. The stadium will be the centre piece of the Northumberland Development Project on a three hectare site which also includes plans for 275 homes, a Sainsbury’s supermarket and a public square. The football club now has to overcome a High Court challenge from Archway Street Metal Works Ltd, the last remaining landowner on the site, before it can commence building works. No one from Anderson Group was available for comment.